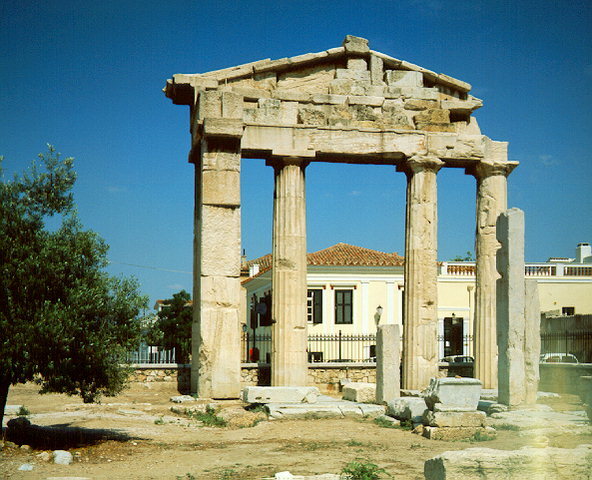 Gate of Athena Archegetis. It stands on the west side of the Roman Agora. The monumental entrance has a row of four Doric columns and a socle made of Pentelic marble. It was constructed in 11 B.C. with the donations of Julius Caesar and Augustus and was dedicated by the People (Demos) of Athens to their patroness, Athena Archegetis.